When you speak, you want to be heard. It makes you feel like what you say matters. It’s essential in every relationship you have. So why wouldn’t you want it out of your smart home technology? Voice-controlled home automation is one of the biggest developments to hit the market in decades, and it’s changing the way we interact with each device in our system. That’s why Control4 has joined forces with Amazon Alexa. How will the new technology affect your Control4 system? Keep reading to find out. Voice control can’t be as simple as it sounds, can it? What about regional dialects, accents, and pronunciation? Actually, it is that simple. Thanks to the Internet, popular voice control platforms can easily understand most commands. And they receive periodic updates that improve their understanding over time. Your Control4 system natively pairs with Amazon Echo and Echo Dot. All you have to do is say a command out loud and your smart home springs into action. For instance, you can say “Alexa, dim the lights,” to your Amazon Echo speaker, and the connected lighting system will spring into action. If you want to get the most out of your voice control platform, integrate it with a Control4 Smart Home system. Control4 allows you to combine command of each smart device in your home. Rather than controlling each component individually, you can combine controls and enjoy a system that works in unison with a single command. When you combine Control4 and voice control, you can access technology anywhere in your home without touching a button. Read on for examples of hands-free control. Family Time: When you’re on the couch with the kids, you don’t always want to search for a remote to dim the lights, lower the shades, turn down the thermostat, and start your entertainment system. Voice control allows you to speak a single phrase and watch all of that happen—automatically. In the Kitchen: If you’re cooking a big family dinner, your hands may be too busy or messy to use a touch screen or the app on your phone. With voice control, you can adjust the lights, put on a playlist, let someone in the front door, and more — all while you remain busy with the oven roast. Before Bed: You’re tired. You don’t want to look at another electronic device before your head hits the pillow. So just tell your system to lock up for you! 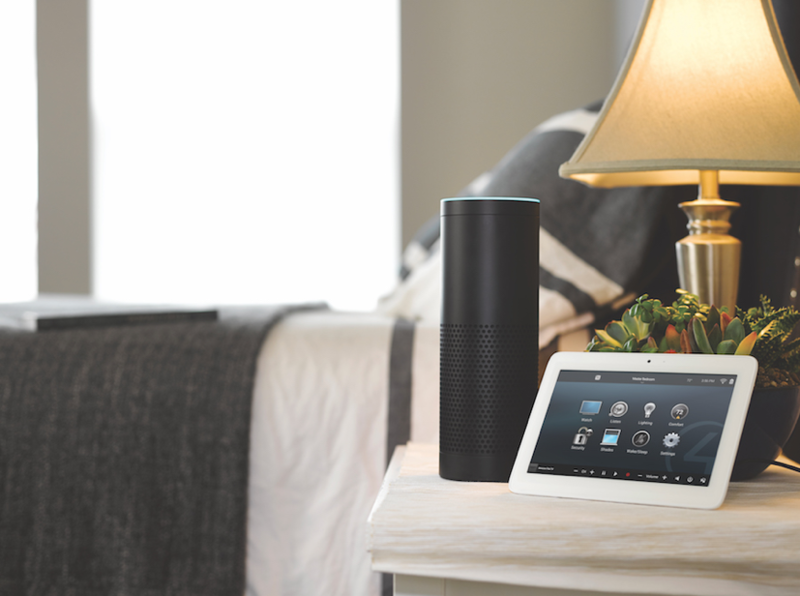 A single voice command can shut down all electronics and lock the connected entryways, so your home remains secure and you get a good night’s rest. How else can you benefit from Control4 voice control automation? Find out for yourself when you stop by our Control4 Certified Showroom. Schedule an appointment today. Can Your Security System Do These Things? Website Design by Blackdog Design Partners, LLC.